I almost always use my table saw to cut miters but as an alternative in my book on tiny boxes, I felt the need to address the compound miter saw and its potential as a box making tool, as many potential box makers may not be able to afford an accurate table saw. There are some things that must be done to make a compound miter saw safe for box making. 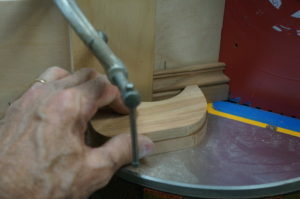 First of all, they are intended for cutting long strips of molding as a carpenter’s tool. That means that a compound miter saw comes out of the box without a zero-clearance backing board or any effective means to clamp small parts. In the normal use of a compound miter saw, it is fairly easy to keep your hands away from the blade, as the stock is usually long enough that holding it securely will require them to be a safe distance away. With small parts, that is not the case. In the photo shown above, cutting miters for a small box, you can see the Baltic birch backing board that I’ve screwed to the miter saw fence. This gives a great deal more support than the fence that came with the saw. I’ve also added a stop block and I am using two hold down blocks to keep the stock in place during the cut. I use two hold downs because when the work piece is flipped over to cut the miter on the opposite side, they will apply pressure independently to the irregularly shaped molding. Two tips that that are essential for both safety and clean cuts: Orient the blade angle so that the wood being cut is pushed toward the stop block, rather than away. And let the blade stop in the down position rather than lifting it back up while still spinning. The wood only needs to be cut once, and in lifting, the work piece may shift slightly and become jammed against the stop block. A third tip is to buy a really good blade. The one that came with the saw may be good for cutting two by fours, but here we’re box making. So, is this my new favorite tool? It can be useful for quick cuts, but for general box making I prefer the table saw.